Even though park rangers, tour guides, and even volunteers are infatuated with the people and environment every time they set foot into this national beauty, many people do not take advantage of these walking tours. Biscayne National Park consists of almost 173,000 acres, making it 270.3 square miles in size. However, 95 percent of this area is water. So instead of park visitors taking a walking tour, they would rather do other activities that are provided by the park such as taking a boat ride, snorkeling, fishing, scuba diving, or even taking a stroll in the water with a kayak. Established June 28, 1980, the park’s peak visitor season is from the end of November through the end of April, being the total opposite from almost every other national park’s best season. From land, one can see that the bay is made up of mostly shallow saltwater and beautiful sea-grass beds. A boat is needed to see the protected and breathtaking coral reefs and colorful fish. Nevertheless, the majority of people who visit the park will take advantage of smelling the sea breeze as they somehow float on top of the clear bluish, green saltwater, but it is without a doubt that these people are missing out on all of the information that they would learn from the jetty walk tours. Thus, they are missing an opportunity to enhance their appreciation and knowledge about this park and its clean, crisp air. The jetty walk tour is a half-mile walk from the main entrance of the Dante Fascell Visitor Center and it follows through a path that starts on a short wooden bridge as it continues onto a trail that is made of rocks as different types of mangroves and greenery cover the trail, cooling visitors and tour guides alike from the blazing sun. 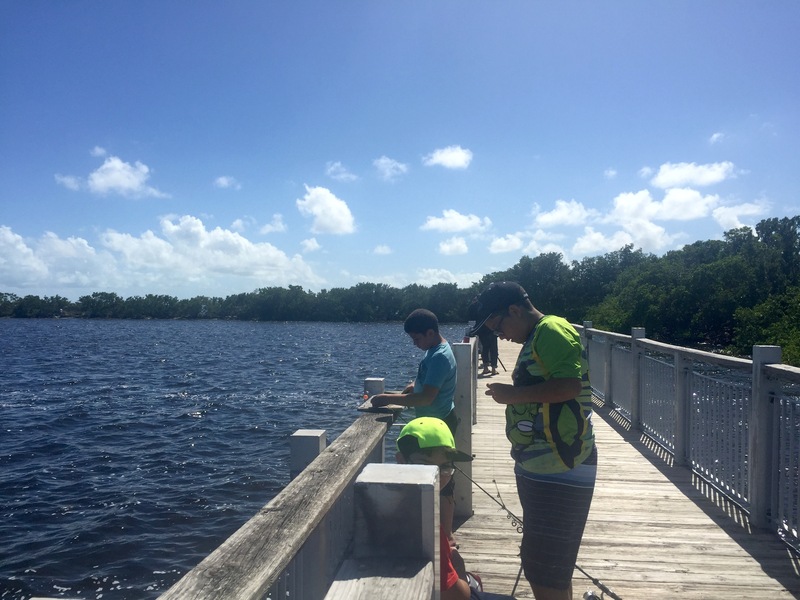 Park visitors fishing along the jetty walk trail at the Fascell Visitor Center at Biscayne National Park (Staff photo). Surrounding this thin strip of land is the somewhat brackish saltwater of Biscayne Bay that eventually connects to the Atlantic Ocean. Though this trail is not necessarily long as compared to other trails from other national parks, it offers the fresh air and natural scenery environment that visitors want to see when they take advantage of the tour and what Florida truly has to offer. Jetty walk ranger-led tours are free and usually take from 30 to 45 minutes, depending on how big of a group is taking a tour. Sadly, visitors are not taking advantage of these truly fun and educational tours. According to the National Park Service website, in October 2014, there were almost 45,000 visitors, but in October 2015, there were almost 28,000 visitors. Just under 600,000 people visit the park each year. It is rangers like Ratajczak who teaches visitors about the ecosystem and animals while helping the park stay clean by picking up trash such as plastic bags and used fish line as she takes a group of around 10 people on a tour. Ratajczak went into detail about so many things some people see almost every day, especially if they live in a tropical paradise such as South Florida. From birds like spoonbill birds and pelicans to plants like mangroves, she educated and taught fun facts to the people on her tour whose ages ranged from 6 to 64-years-old. Visitors learn about things they would never even hear of if it weren’t for going on a jetty walk tour. Once the “oohs” and “ahs” come to an end after every fact shared, there is no question that visitors will get more out of taking a jetty walk tour compared to visiting the park alone. Even if one is more interested in the aquatics of the park, these walking tours give you the facts that you need to know before venturing off by oneself into the bay. If weather becomes a restriction to taking a tour outside, park rangers and guides offer free indoor educational programs about the national park’s history, animals and ecosystem. The park is open 24 hours a day, seven days a week and has no entrance fee and few expenses for visitors unless one is renting equipment or planning to camp overnight at the park. The visitor center is open from 7 a.m. to 5:30 p.m. during the season and 10 a.m. to 5 p.m. during the summer. The park offers numerous programs and jetty walk tours, which are scheduled online. If one cannot make it to a tour that is on the schedule, just call and a personal tour can be scheduled over the phone. Nevertheless, the jetty walk tour is something to be remembered and not forgotten at Biscayne National Park. After taking a tour with one of the park rangers or tour guides and seeing the smiles on peoples’ faces once they learn something new, one will truly grow a new and fulfilled appreciation for Biscayne National park, its animals and ecosystem. Not forget to mention, visitors will have a great and fun time. From South Miami Avenue, get on I-95 North then take Florida state route 836 West. Keep left at the fork and continue onto exit Florida state route 826 South and merge onto Florida state route 826 South and continue to keep left until you reach Florida state route 874 South where you will see Homestead signs. From there, merge onto Ronald Reagan Turnpike and take exit 6 for SW 137th Avenue toward Speedway Boulevard. Follow SW 137th Avenue and SW 328th Street until you reach the visitor center, which will be on your left. Overnight camping is $25 per night. Bring water, sunscreen, a hat, and snacks.